Essentials for nourishing your body’s largest organ – THE SKIN: a loofah brush, dry brushes, exfoliating gloves, and organic, raw coconut oil. Perhaps one of the most important lessons that I have learned is about the Skin. Skin is the largest organ on the body and it has a couple of really important functions. The first is to provide a way for toxins to exit the body mainly by sweating. When we block the body’s ability to expel toxins, it has no choice but to deposit the toxins elsewhere in the body, sometimes in the form of tumors. That is why it is NOT a good idea to wear antiperspirant. Under the arms are the main areas that the body uses to expel toxic build up. Toxins smell, so the worse one’s body odor is, the more toxic their body. Example: a newborn baby who is nursed has no odor to their stool; it is only when they begin to eat processed foods that their stool is stinky. I don’t think that we should put anything on our skin that we can’t put in our mouth. We know that there are certain meds that come in a patch form that goes on our arms and they are effective because they chemicals go straight into the bloodstream. I don’t understand why skincare companies are allowed to put toxic chemicals in their products. If a product says, “if ingested call poison control” it is not a good idea to put it on your skin. Raw organic coconut oil is a fabulous product to use on your skin. It softens the skin and feeds the body. Coconut oil is a powerful brain food, and that will be the subject of another blog. What can we do for our skin to help it rid our body of everyday exposure to toxins? 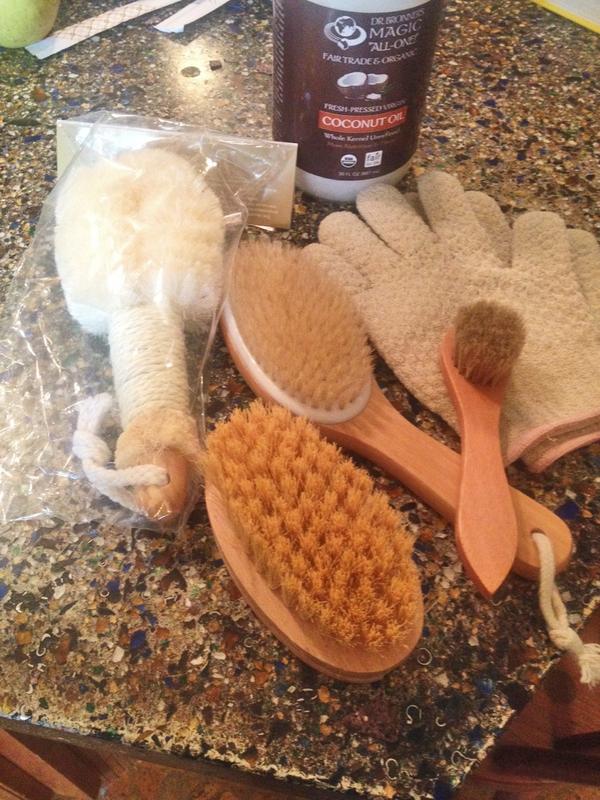 Dry brush or use exfoliating gloves in the shower. In order to help our skin breathe, we need to exfoliate (get rid of the dry flakes) our skin. To dry brush, start at the tips of your toes and hands and brush toward the heart. This actually does two fabulous things for your body – it removes the dead skin so your pores can breathe, but it also stimulates the LYMPHATIC system. The lymphatic system is a system in the body – much like the blood system -but its function is to collect the toxins in the body. Unfortunately, there is no pump on the lymphatic system, so if you don’t move around, the toxins sit. This is why any kind of exercise is important and especially rebounding (see The Cancer Answer for more information) because it stimulates the lymphatic system and helps it drain. However, dry brushing the skin also stimulates the lymphatic system which is huge! Every day whether you dry brush your skin or use exfoliation gloves in the shower, you are helping your skin breathe, stimulating the lymphatic system to drain and your body to rid itself of toxic build up. Please watch YouTube videos to learn more about this. There is a lot of information out there!